I could not have done it without your videos. giving me advice and information so I can get it running. its laggy as hell, but its running. I am getting numbers next to ALL items in game. and then when i tried to make a simple recipe book. a couple of other things can not be done. it will not do it. Yes I placed everything EXACTLY like you did. has been broken or what. Has this happened to you.?? 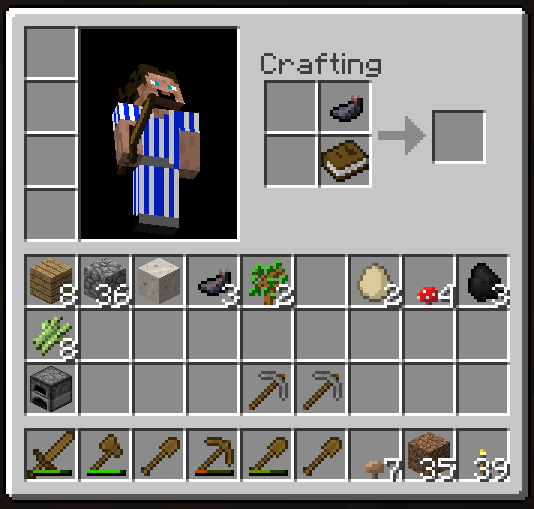 But question still remains as to why the recipe book wont build? This darn book wont buld..
also many other things wont build..... something is wrong , dont know what it is. and also I am hearing things burn, like for example things jumping in lava. but there is no lava any where next to me, or monsters. and I am on top of the mountain or at a lake. its like im hearing sounds to things that are not around. 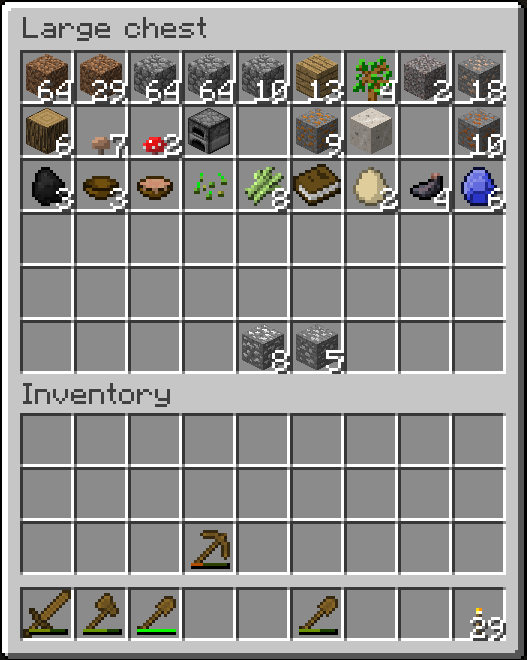 Tin Ore wont pile, its like I have 2 kinds of Tin Ore.
but they both say just Tin Ore and copper is doing the same thing. 2 different kinds of copper. is this suppose to happen.? I don't have any experience modding on a mac, but you definitely don't have an ID conflict or your game would crash before you got to the main menu. I couldn't find anything on google, but Audiomod is optional. If you think that is the issue, you could try the game without it. If it works, I am not sure how to get Audiomod to work for you but you can play the game minus some sounds. The craftguide is different from risugami's recipe book. It requires 4 books, 4 pieces of paper, and a crafting table in the middle. By default IC2 generates tin and copper, and RP2 generates a different tin and copper, and they don't stack. However they will work in the same ways in recipes (although you can't mix the two different types in the same recipe) and when you get to the stage where you can macerate ores, they will macerate into the same powder, and cook into the same IC2 copper ingot. The sounds thing I am not sure about, are you positive things aren't underground in near-surface caves? If you want to change the ore from 2 of the same type "mind you I would do it before starting the world"
# Automatically remap conflicting IDs. Ive been noticing its been doing it on many ores. Very cool to know. Will save this code in a safe place. Implementing when I start a new world. I even went really high on a mountain. it still did it. I re-did the Audio MOD again, and it got rid of many of it. Thank you for the great explanation. I learned a lot from it. really helps me get to know these mods better. Gave +1 to both of you. Did you upgrade to forge v1.2.3? I see you have the PRe4B of Redpower. I would upgrade Buildcraft to 2.2.9. Looks like a buildcraft issue :smile.gif:. Location: In Hell, counting me souls. You should (with permission) make a mod pack. That would be a HELL a lot easier than just installing mod by mod, one at a time. Nice series, by the way! You have to redo a mod again. damn I am desperately trying to remember. I just did it yesterday. and then I had to reinstall a mod and everything was fine again. even though it says its only for forge 1.2.2, it worked after I did it. and fixed problems I was having with forge. it seems to fix all kinds of problems, when i installed. that (zAdditionalPipes Rev31.4) you dont need. because someone else updated it. java.lang.RuntimeException: RedPowerCore: BlockID 252 exists, autoAssign is disabled. if it dont im sorry. I sat here trying to figure out where this goes here or in support section of forum. The question is, Do I need a special tool to pick it back up. I dont want to start hacking at it and lose it. I just want to move it to a different location. of some kind in order to pick it back up. PWS, there should be a video that would show what tools are needed to pick up certain machines and units. thinking its going to come back to them, when in fact it will break. I seem to have a proble with Wireless Redstone. I can craft both the Transmitter and the Receiver but for some reason I can't add a restone torch to the transmitter to turn it into a Remote Transmitter and the the remote does not even show up in TMI. Theres an addon section in the wireless redstone forum post, sorry I wasn't clear on this, the Wireless Remote is in there. hello everyone i am have having trouble with minecraft forge 1.2.3 and industrial craft every time i add it to the mods foulder i crash and get this error report to go with it. Java: 1.6.0_20, Sun Microsystems Inc.
OpenGL: ATI Mobility Radeon HD 5470     version 3.2.9262 Compatibility Profile Context, ATI Technologies Inc.
Looks like you installed everything ok in the minecraft.jar but perhaps you loaded Minecraft before you finished putting everything in the mods folder. Start over with a fresh install, you can save your modded minecraft.jar and overwrite the fresh jar that you download with it, and then make sure you put all the mods in the mod folder before you start Minecraft again. OpenGL: ATI Mobility Radeon HD 5470 version 3.2.9262 Compatibility Profile Context, ATI Technologies Inc.
Could you post the contents of your modloader.txt? Did you try starting fresh since you updated forge?